Are you looking for your next (or possibly first) adventure overseas? Have you ever considered working in Asia? 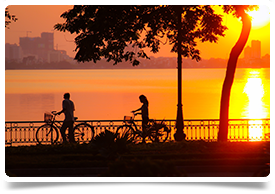 We have a rare and exciting opportunity available for an Orthopaedic specialist to join an established private hospital group in one of their clinics in Hanoi, Vietnam. Helping to set up a new service, you will be joining the most reputable and famous international healthcare provider in the country. Expats are attracted to Vietnam by the good weather, low cost of living, lively culture and the steady improvements in Vietnam’s infrastructure - and this is the opportunity of a lifetime! We are seeking a specialist who has experience in treating musculoskeletal trauma (fractures contusions, wounds) degenerative joint diseases (arthritis, osteoporosis) and sport lesions (sprains, dislocations, muscle disruption, stress fractures) with a deep interest in upper limb and knee. Hanoi is the capital and second largest city in Vietnam and with its colonial architecture and vibrant street life it is consistently ranked among the world's top 10 destinations by big name travel sites. For many Hanoi is used as an entry point for visitors drawn to the country’s mountainous north but there are many reasons why people decide to stay longer, including the numerous lakes, fantastic restaurants, vibrant night life and Southeast Asia’s best preserved colonial architecture. It's described as one of the most beautiful cities in all of the world, along with being one of the oldest in Asia. Those moving to Hanoi find a city that maintains a balance between significant development (large shopping malls, new roads) and preserving a relatively cheap cost of living. You can live an exceptionally high standard of living on a salary of only 3000 USD equivalent per month. Hanoians are proud people; they take pride in their cuisines, their etiquettes, their rich tradition and eating Hanoi food is listed among some of the best food experiences in the world. The city is packed with museums, monuments, cafes, restaurants, discos and handicraft stores so there is a bustling lifestyle available for those keen to immerse themselves in the Vietnamese way of life. PLEASE NOTE THAT APPLICANTS MUST SPEAK AND WRITE ENGLISH AT A FLUENT LEVEL and you should ideally have a minimum of 3 year’s post CCT experience.